Do you use any special materials? Leslie: I rely on Saunders Waterford watercolor paper manufactured at St. Cuthberts Mill in Somerset, England. This mill has been in operation since the 1700s. Their paper has a lovely surface, and it is a pleasure to use. It is ideal for me because I like subjects with strong contrasts, and dark passages remain transparent and luminous on Waterford paper. I use round brushes more than most American artists. I do have two wonderful 30-year-old ox-hair flat brushes for covering large areas quickly, but the rounds seem to give me a greater variety of shapes and edges. Harold: I tend to choose paper and canvas for its texture. A textured support grabs the paint off the brush and allows me to directly layer color over color in an impressionist style. To me, the results seem more true to nature. When we look at the world, we summarize many bits and pieces and see them as a unified whole. We really don't take notice of every blade of grass or leaf on a tree. Leslie: Yes, we share our studio. There's good lighting at each end of the space. Harold installed picture shelves along one wall so that we can easily rotate the paintings on display. A rocking chair, shelves of art books and storage for art supplies are tucked around the perimeter of the room. 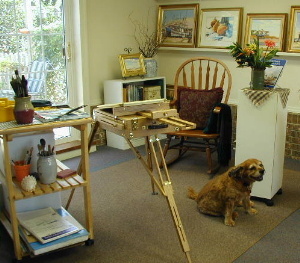 Our easels take center stage. I enjoy Harold's company when I paint. We constantly exchange ideas and techniques. And it's all too easy to stop seeing a work-in-progress as a whole. That's when the opinion of another artist is especially important. Harold: We also enjoy traveling and painting together on location. Leslie and I have compact painting gear that allows us to paint outdoors without changing our style or methods. We share ideas about our subjects as we set up our easels as well as express our thoughts about possible compositions. Plus we later have the added enjoyment of reliving our painting memories together. Leslie: My parents purchased an original watercolor when I was a young teen. Over time, its loose brushwork and luminous color provided me many hours of enjoyment. 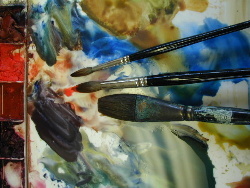 Several years later, a local watercolor artist began to offer watercolor classes nearby. 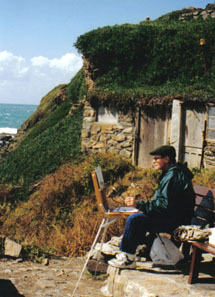 Not long after, I took my first watercolor workshop with Edgar Whitney. From that point forward, I knew that watercolor would always be part of my life. Harold: I had watched Leslie paint for years, but didn't think about trying it myself until I was laid up with a broken leg one autumn in Colorado. We were fly-fishing on the Green River, and there was a nice hatch coming off. The trout were actively feeding when my last fly that matched the hatch got caught in a tree on a backcast. I fell from the tree trying to retrieve it--three miles from our vehicle. Painting seemed like a much safer activity. Where do you get your ideas for subjects? Leslie: I take many of my subjects from our travels and excursions. My interests are somewhat eclectic. I find compositions at the local flea market, in a neighbor's pasture, or on a London street. However, I do tend to gravitate toward subjects that feature architecture or boatyards, and they frequently contain figures. I usually like a little "life" in my paintings. Harold: I select painting subjects in response to my reaction to my observations of the environment such as a dramatic cloud formation, the graceful lines of a ship or an arresting pattern of colors in a flower garden. This reaction creates an emotional stimulus that prompts me to represent my association with the subject on canvas. I employ a strong intellectual focus and technical skills to both describe the subject and suggest my personal response to it. Leslie: I enjoy teaching just as much as I enjoy painting. It's exciting to exchange ideas with fellow artists, and the camaraderie shared among enthusiastic painters is inspiring. Each student brings a unique perspective to the classroom or workshop, and I sometimes think I learn as much from my students as they do from me. Teaching also gives me a chance to focus on the basics and to consolidate my thinking about making art, which in turn makes me a more effective teacher. Harold: My goal in teaching is to pass along traditional training in the visual arts. Many of the fundamental painting and drawing skills are woefully neglected in current art instruction, and that essential core of knowledge is sometimes endangered to the point of extinction. So many talented people have the intelligence, wit and enthusiasm to make good painters without having access to the instruction that would allow them to do their best work.